In a baffling fit of rage, an Oregon State Police officer has been convicted of ramming his car into a stopped motorcyclist then kicking the dazed man so hard in the chest that he would need a metal plate and screws to repair his shattered collarbone and ribs. What State Police Captain Rob Edwards didn’t know was that his department have installed a functioning dashboard camera. It captured the entire shocking scene. The 2012 incident with a chase that the victim says he didn’t know was happening. The first he learned of Edwards’ presence was when the cop was running directly into the back of his motorcycle, spilling the man from his bike. The man gets up with his hands raised only to find Edwards rushing at him with his pistol held sideways, probably imitating something he saw in a movie. The biker, identified as Justin Wilkens, barely had time to say “What did I do?” before Edwards kicked him square in the chest with such force that Wilkens would later learn he broke his collarbone and several ribs. Edwards would later say that he was “frustrated” with Wilkens for not complying to his demands sooner (how? ), and that hedidn’t realize his car was equipped with a functioning dashcam. What Edwards didn’t know was that the unmarked car he was driving was equipped with a functioning dashboard camera. So when Edwards eventually struck Justin Wilkens’ motorcycle with his car, then pulled his gun and kicked Wilkens in the chest, he did not know that the whole episode would be played – again and again – before a U.S. District Court jury. It’s not hard to see why the dashcam was a bitter pill for Edwards — thanks to the footage his trial lasted all of three days and he was promptly convicted. He and his department will now have to pay $180,000 in damages. Bizarrely, Wilkens could have received more but the jury decided that a cop pointing a pistol at his head didn’t constitute psychological damages. How militarized has law enforcement become in America?A cop aiming sideways guns at complying suspects is now considered so routine that courts are suggesting people just get used to it. In the past year, the conversation over police cameras has consumed the debate over police abuse. Some critics have pointed out that cameras didn’t lead to justice for victims of police abuse like 12-year-old Tamir Rice and in the horrific death of Eric Garner. But on the other hand, it’s hard to imagine cops like Edwards receiving any sort of punishment without them. 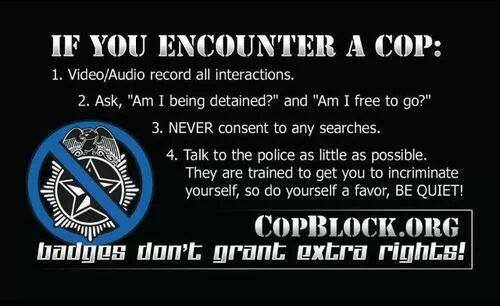 For instances where cops cross the line, video of them doing so can be a godsend to the victims. Juries tend to err on the side of the police, but even they can’t ignore what they see with their own eyes. Usually.